Lily hasn’t always had it easy, but that’s never stopped her from working hard for the life she wants. She’s come a long way from the small town in Maine where she grew up— she graduated from college, moved to Boston, and started her own business. So when she feels a spark with a gorgeous neurosurgeon named Ryle Kincaid, everything in Lily’s life suddenly seems almost too good to be true.Ryle is assertive, stubborn, maybe even a little arrogant. He’s also sensitive, brilliant, and has a total soft spot for Lily. And the way he looks in scrubs certainly doesn’t hurt. Lily can’t get him out of her head. But Ryle’s complete aversion to relationships is disturbing. Even as Lily finds herself becoming the exception to his “no dating” rule, she can’t help but wonder what made him that way in the first place.As questions about her new relationship overwhelm her, so do thoughts of Atlas Corrigan — her first love and a link to the past she left behind. He was her kindred spirit, her protector. When Atlas suddenly reappears, everything Lily has built with Ryle is threatened. I am so late to the Colleen Hoover party but she has been on my radar for a looong time! Friends, bloggers, co-workers, everyone I know has raved about her. The first book I read from her was All Your Perfects, which I received for review in 2018. I was instantly hooked! I am now making my way through her backlog and decided It Ends with Us to be my next choice! Never, have I experienced such an emotional rollercoaster! This book WRECKED me; I am not exaggerating one bit. I laughed, I cried and there were moments where I wanted to strangle the words right off the pages. It Ends with Us is the definition of 'Just one more chapter'! I found myself devouring this book any chance I could and even contemplated canceling all plans and calling in sick to work just so I could continue reading...Who needs sleep right? 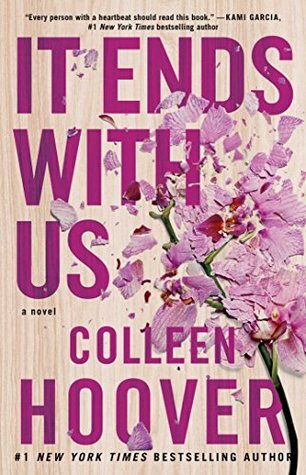 It Ends with Us is told from Lily's perspective. We learn about her first love Atlas, through 'Dear Ellen' diary entries, where she addresses her entries to Ellen Degeneres, and her new love Ryle Kincaid. The story of Atlas and Lily was both beautiful and heart-breaking. I could have read a whole book on just the two of them! And then we meet Ryle. Who is just as swoon-worthy. BUT, to keep this review spoiler free, that is all I am going to say about Ryle. You'll just have to pick up the book to find out for yourself. Hoover does a spectacular job at drawing you inside the world of her characters. You feel almost intrusive as you are reading through their most raw and vulnerable moments. I was a sobbing mess at times! And though I would never harm a book, there were moments that I wanted to toss my copy across the room. I am now a proud Colleen Hoover fan! I cannot wait to read my way through her work and will eagerly await her future releases! It Ends with Us is both heart-breaking and heart-warming. It is not only a book about Lily and her journey, but a book about self-discovery. A story about a young woman navigating her way through life and finding where she belongs. Have you read Colleen Hoover? Comment and let me know what I should read next!